Days 9, 10 and 11 of my organic lawn renovation project were pretty tough. A lot of raking, digging and incorporating compost. I ran into some snags that made it even more difficult but hopefully it will all be worth it when my new lawn comes in. The first major step was to kill off as much of the existing lawn as I could using two organic herbicides instead of RoundUP. (See BurnOut II vs Nature's Avenger.) 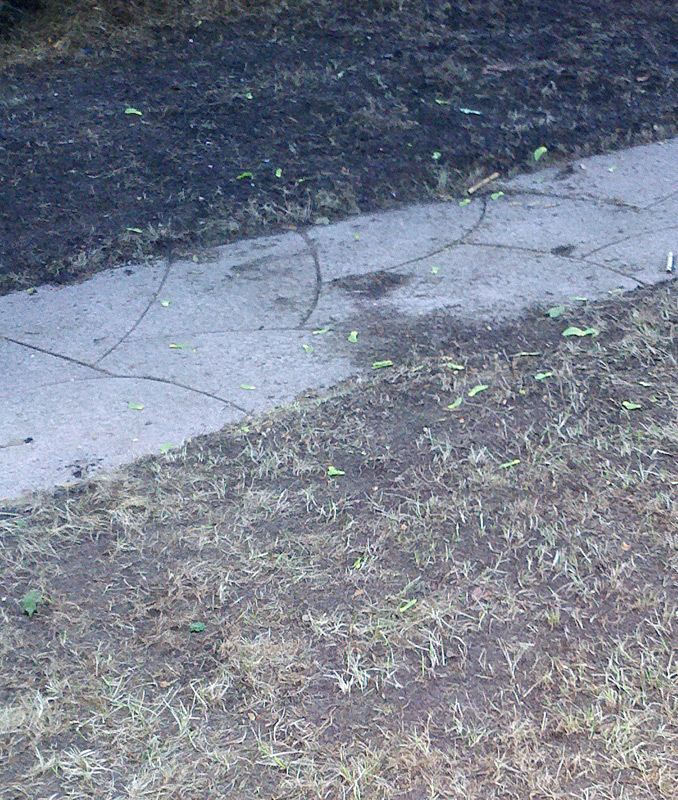 That went pretty well and both killed a large majority of the existing grass and weeds. There was some weedy looking tall fescue that was coming back too fast and I decided to dig it up before I went on to amending the soil, leveling the lawn and seeding. Details discussed below. The first step was to get rid of the nasty Tall Fescue that seemed to be a little too stubborn for the organic weed and grass killers. Some of it seemed to be an improved tall fescue but most of it was unimproved, wide bladed fast growing and ugly. There might have also been some orchard grass in there as well. It was only in Section 1 which was about 300 sq ft. I keep eyeing a Mantis Electric Tiller but haven't actually bought one yet. I called about renting a tiller and it was only around $50. I saw this Sun Joe Electric Tiller/Cultivator which is only twice as much as renting and now renting seemed like a waste of money but there wasn't enough time to get the cheaper tiller. Plus some of the reviews are bad for this model. I decided to just grab a hoe and a rake and start tearing up that section by hand to pull out the clumps of tall fescue. By the time it was half way done I was regretting not renting the tiller because it was very hot that day. Three and a half hours, 1 gallon of water, 64 oz of Gatorade later and I had dug up all the tall fescue clumps and raked them out of the soil. The amount of wide bladed, unimproved tall fescue I pulled out was enough to fill up a leaf collection bag. BurnOut II and Nature's Avenger killed about 95% of the grass in this section. It did a bit of damage to the fescue but it was just growing back too fast. After going over the area with my thatch rake there was a lot of bare soil. Once I was done digging out the fescue it was more like 99% bare soil. In hindsight doing it by hand was probably better because the fescue wasn't torn up as much as it would have with a rototiller and I likely got more of it out of the soil than if I had rototilled. 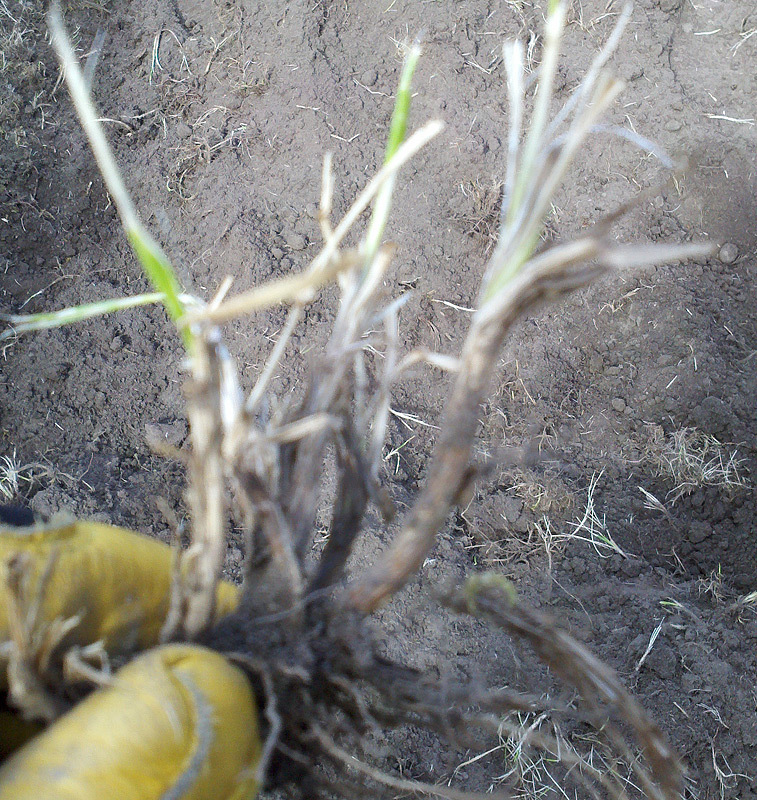 This grass is tough and would have reestablished if not removed. 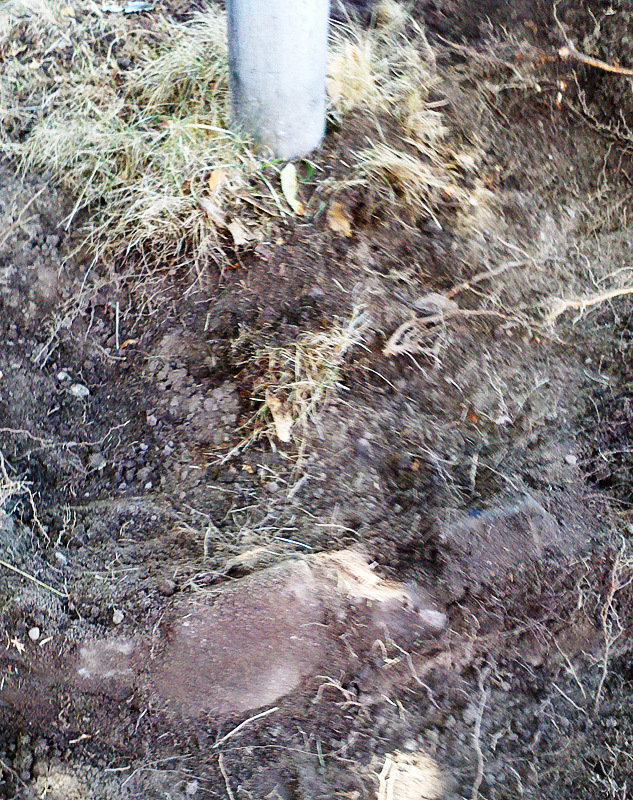 Unfortunately digging up the soil like that can bring up weed seeds that had been waiting deep in the soil. Since I was putting down new grass seed it seemed like a good time to regrade the lawn. There were some awkward high and low spots that made it difficult to mow. I also had to smooth out Section 1 which I had dug up. In Section 2 there was this strange hump around the lamp post. It caused a lot of problems. It's a small section and the lamp post is fairly close to the edge of the lawn. 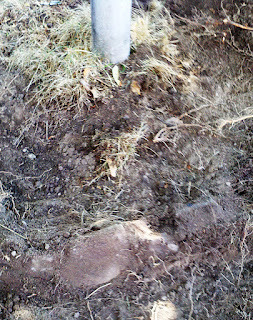 This caused a very steep slope from the post to the edge. In the winter water would shed off here and sometimes freeze on the front walkway. If I kept one side of the mower's wheels on the walkway I'd wind up scalping part of the lawn and it would fill up with weeds. If I kept both wheels on the lawn I'd have to struggle to keep the lawn mower from sliding the slope. It was also impossible to get a nice edge. After edging the soil would slowly slump down since it was a couple of inches above the walkway. It didn't take long to figure out why the hump was there. I kind of expected it but was really hoping I was wrong. There used to be a ring of landscaping stones around the lamp post creating a small circular planting area. I guess someone decided they didn't like the planting bed any more and rather than remove the stones, they just covered it up with dirt and put down grass seed. Some soil might have been removed from the back of that section since it was noticeably lower than the other sections. This was a problem because it was up against the foundation where water can pool during rain. Luckily there were never any water issues. These weren't little bricks that were laid out around the post. These were rocks buried 10-12" into the dirt. It took some work to get them out. On the plus side I'll have some decent looking landscaping stones once I power wash them. After the stones were removed I used a bow rake to spread the soil out and give the soil a proper grade away from the house while providing a more level surface that I can mow and edge easier. My plan was to buy a level headed rake but instead I wound up borrowing a bow rake. The bow rake, along with my thatch rake did a good job of moving the soil around to smooth it out. The bow rake was one of the nice old forged ones with a wooden handle that I don't think you can buy any more. I went looking and the closest I could find was this Kodiak Forged Bow Rake . It's a little more than the welded steel aluminum bow rakes you usually find but if it holds up as long as the one I was using did it's worth it. My lawn's soil wasn't that great and even with mulch mowing my clippings, fall leaves and spreading organic fertilizers it was a bit low in organic matter so I planned to incorporate some compost. Since I was only doing a small section of my lawn I couldn't find any place that would deliver that little bulk compost. I had to get bags of compost from my local garden center and since I don't have a truck I had to make multiple trips to bring that 800lbs of compost home. My plan was to get some plant based compost and some composted manure but when I got to the garden center they only had composted manure. 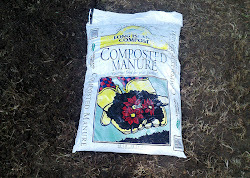 It's not plain composted manure but also has some grass clippings and leaves composted as well. From what I understand it's primarily duck manure. I got enough 40lb bags to spread a little more than 1/3rd of an inch of compost over the sections I was renovating. The composted manure was from Long Island Compost. It was very clumpy and moist and I couldn't see how anyone would be able to topdress with it as the back of the bag indicated. I broke the bags of composted manure in half with my spade and the product practically came out in too big chunks. It smelled fine though. Since I was almost starting with a clean slate I would be able to wrestle it into the ground. 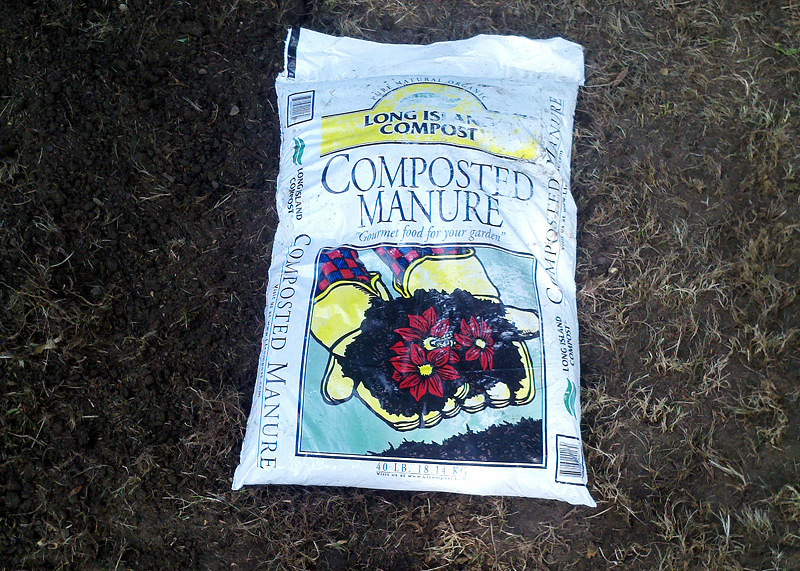 After I was done applying the compost I contacted LI Compost and was informed the Long Island Compost Composted Manure was meant more for gardens and not lawns. When the bags are packed on pallets and sit in garden centers awaiting purchase they get compressed from the weight of other bags on top of them. I was told their Hampton's Estate Premium Composted Manure or Premium Topsoil would be a better fit for applying to lawns. The Hampton's Estate line is double screened and has peat moss mixed in to give it a better texture. Update: LI Compost provided me with a few samples of their other types of compost and top soil. The Hampton's Estate Premium Composted Manure is very fine and loose. It's a much better material to top dress with. They didn't know anything about my blog or my renovation, just that I purchased a lot of their compost. Using my thatch rake and Garden Weasel Cultivator I was able to incorporate it into the soil. It was more labor and time intensive than I thought it would be but the thatch rake made things go smoothly. I'm really surprised by how much I use my thatch rake. I initially purchased a thatch rake to remove ground ivy from my lawn but it has so many other uses in the garden. It can be adjusted to a more aggressive angle that pushes the tines a few inches into the soil which helps loosen it and the cultivator end of the tines (the bent tines) help pull up and incorporate amendments. By working the thatch rake back and forth over a small area, then pulling in some composted manure, breaking it up with the thatch rake, then again going back and forth until the composted manure was broken down into small particles and mixed in with the existing soil I wound up getting a nice layer of rich topsoil that was a few inches thick. You can see what a difference the compost made in the picture on the right. The top section is Section 3 which had the compost incorporated and on the bottom Section 2 which did not. The soil in the top section looks dark and rich while the bottom section looks grey. One benefit of having to manually cultivate the soil so much with the thatch rake is that I was able to get out some more of the grass that hadn't been killed by the organic herbicides I used. 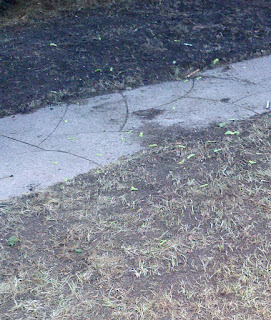 These 2 sections don't get as much sun as the other section and there was still some grass left unharmed. The majority was desiccated by the spraying and removed with the dethatching but the more aggressive cultivating with the thatch rake trying to get those clumps of composted manure broken down got rid of some of what was left. Some of the grass was just buried in the new soil. I was going to apply an organic starter fertilizer and lime as well but the composted manure has a guaranteed analysis of 0.5-0.5-0.5 which will provide more than enough nutrients based on how much I applied and the Fast Acting Lime I applied a few years ago is still keeping the soil pH where it needs to be. Before frost hits I might add some Fast Acting Gypsum to increase the calcium and lower the pH because it's seems a little high. I had a hard time deciding which grass seed to go with. I had decided to go with Turf Type Tall Fescue instead of Kentucky Bluegrass. One of the grass seed mixes I was considering was Black Beauty grass seed from Jonathan Green. It looked like a nice grass and had decent results. I was considering another custom blend but in the end the small patch of Black Beauty I grew in a container wound up looking very good. You can check out my time lapse video of Jonathan Green Black Beauty germinating. The thing that tipped the scales in favor of Black Beauty was Jonathan Green's great customer service, they were a local business in my state and it was a seed I can pick up from my local garden center if I need more. 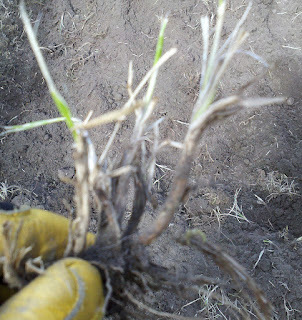 I was able to see more pictures of actual Black Beauty grass seed than I could the other varieties I was looking into. Before spreading the seed I lightly scratched the soil with my thatch rake to loosen it, then I applied the Black Beauty Seed with my Scott's Accugreen 1000 drop spreader which I don't think they make anymore. The Accugreen 100 has different spreader settings than other Scott's drop spreaders and I had to guess what the correct spreader setting should be for Jonathan Green Black Beauty. I knew how much seed I would need and added it to the spreader's hopper, set the spreader to 9 and made two passes over the lawn in two different directions and still had more than half of the seed left. After increasing the spreader setting to 12 I made 3 more passes in different directions and used up all the seed. More passes than I wanted but the seed went down evenly. I went over the soil one more time lightly with my thatch rake on a less aggressive setting so I could scratch the seed into the soil to cover the seeds about 1/4" then watered. Until the seeds germinate I'll be lightly watering 3 or 4 times a day. Around 8am, 12pm and 4pm. The test container of Black Beauty I had germinated in 3 days because it was a more controlled situation out of direct sunlight and since it was sitting on my desk I could water it more evenly. I expect the Black Beauty seed outdoors to germinate around the 7-10 days indicated on the bag. This was a lot of work and now I have to just wait and water patiently and hope everything works out. Different areas have different composting companies. In my area, LI Compost is one of the bigger ones. In yours I take it it's Leaf Grow.